Port Hardy Seagate Pier. Photo: Kim C.
At the very northern tip of Vancouver Island is Port Hardy – a small town with a spectacular backyard. Port Hardy, home to about 4,000 people, is the largest community on the North Island and serves as a regional hub for transportation and services. 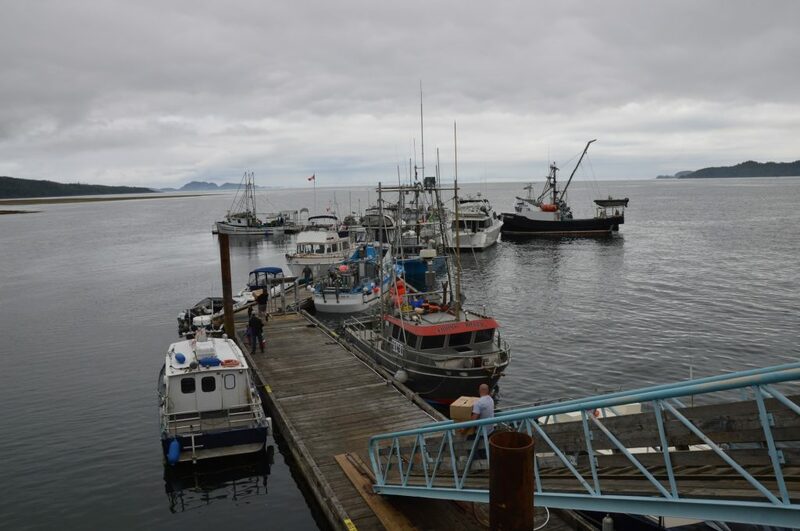 Port Hardy can be reached by vehicle (about four hours from Nanaimo), boat (BC Ferries links Port Hardy with Prince Rupert and the Central Coast), and air (the Transport Canada airport offers daily flights to Vancouver and beyond). There is also regular bus service via transit to nearby communities and express service to the rest of Vancouver Island via the Tofino Bus Island Express. Port Hardy Coast Guard. Photo: Kim C.
Port Hardy offers plenty of accommodation options for both camping and fixed roof accommodation. When we recently visited, we were arriving after a week of kayaking in the Broughton Archipelago and were seeking somewhere affordable, centrally located, with laundry facilities. We easily found lodging with a spotless room and kitchen facilities making it easy to cook our own meals, and the staff was exceedingly helpful and gave us tons of suggestions for things to see and do while in the area. Arriving after 5:00 in a community with zero plans sometimes backfires, but in this case, we discovered a true gem. Coal Harbour. Photo: Kim C.
At the recommendation of the staff, we spent the next couple of days exploring Port Hardy and the surrounding area. Our first destination to visit was Carrot Park right on the Port Hardy harbour. What an unusual name for a park, you might be thinking – and you are correct! Carrot Park, complete with large wooden carrot carving, marks the start/end point of the Island Highway which links Port Hardy and Victoria. The highway was quite controversial, and despite promises of a highway link as early as 1897, the actual route was not completed until the end of the 1970s. A dangling carrot, indeed. From Carrot Park, a seafront walkway extends nearly half a kilometre along the harbour. Pop in to the visitor centre along the route in order to learn more about the history of Port Hardy and any special events happening in the community. Continue your walk out to the Seagate Pier, where Canadian Coast Guard vessels dock and locals fish off the dock. Seagate Pier, Port Hardy. Photo: Kim C.
Once you have had your fill of town life, head for the hills – literally – and pack your bag for a short hike to a Provincial Heritage Site in the form of the wreckage of a Dakota 576 plane that overshot the runway, ran out of fuel, and crashed near Bear Cove in April 1944. To do the 40-minute one-way hike, park at Bear Cove Park and walk a bit further along the main road until you see a narrow, paved route heading uphill on the right hand side of the road. Follow this route, eventually staying to the left when the route forks, and then follow the flagged trail until the wreckage of the plane emerges ahead of you. The site is a humbling one, as two of the three crew members were killed in the crash. The wreckage is in remarkably good condition given that it is has been in a rainforest for 74 years. Take your time to soak in the site, and most importantly, be respectful of the site’s significance – pack out your garbage and leave the site better than you found it. After your hike, head to Fort Rupert to relax on Storey’s Beach – a sandy beach that seems to stretch for miles when the tide is low. If you want more activity consider a walk on the Fort Rupert/Commuter Trail – a nearly four-kilometre trail consisting mostly of crushed gravel and boardwalks that links Bear Cove and Storey’s Beach. For a full day adventure, the Tex Lyon Trail departs from near Storey’s Beach and follows the coast to Dillon Point. One of the best things about Port Hardy is that it serves as a jumping off point to explore smaller communities in the region. From Port Hardy, Holberg, Winter Harbour, and Coal Harbour are all accessible by road – although to visit Holberg and Winter Harbour you need to travel on active logging roads. Cape Scott Provincial Park, north of Holberg, is home to the famous North Coast Trail. For those not quite ready to commit to 40+ kilometres of wilderness hiking, Cove Adventure Tours in Port Hardy can get you out on a one-day tour of San Josef Bay that includes a bit of hiking and plenty of beach time on the rugged west coast. Coal Harbour, about 20 minutes via paved roads from Port Hardy, is home to an interesting museum featuring a private collection of items relating to the community’s varied history and makes an excellent mini road trip. Coal Harbour has served as a base for logging, fishing, and whaling, in addition to a stint during World War Two when the community was a Royal Canadian Air Force Base. The museum has a large collection of interesting items including chainsaws, a fire truck, plenty of photos, and the show-stopping piece – a 6 metre jawbone from a blue whale. The museum is located inside a floatplane hanger, and if you are lucky, you might get to witness a plane taking off down the inlet, carrying goods and people to one of the nearby logging camps. Coal Harbour Totem. Photo: Kim C.
The northern tip of Vancouver Island is both rugged and beautiful. With plenty of opportunities for hiking, fishing, kayaking, and wildlife viewing, it makes a great destination for those who love the outdoors.